Spread More Love: They're Back!! This week was a crazy, emotional week. I found out that my insurance won't cover the surgery for the burn scar on Munni's scalp. She has multiple scars on her scalp that we were just going to leave alone, but the big one is on her crown and the sun hits it. Another reason I was hoping to have it minimized was to hopefully eliminate all the rude comments we get like "What happened to her head?" that people ask RIGHT IN FRONT OF HER. Seriously, what the heck??? Like Jennifer Aniston said about Brad Pitt, these people are missing a sensitivity chip. Finding out about the insurance was really frustrating. Now I'm going to look into applying with Shriner's to see if they can help us. Luckily, the Shriners here specializes in burns. Now that we are down to only 2 departments for the surgery instead of the original 4, I'm hoping it will be scheduled in the next couple of weeks. I'm ready for all of this stuff to be behind us so we can continue to move forward. Wednesday was 9/11 and is usually an emotional day for me. It still is but this year, however, it was coupled with joy and hope because it is also Sweet Baby R's birthday! Munni and I wanted to celebrate her even though she isn't home with us yet. 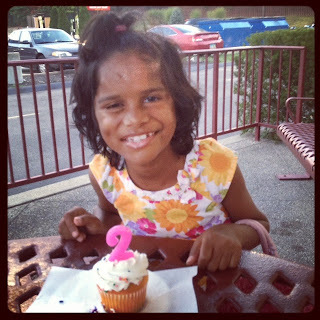 We want her to know she was in our hearts, minds, and prayers long before she physically could be part of our family. We woke up and sang happy birthday to her and then later that night, went out for dinner and dessert. Munni blew out the candle for R :) She's such a great big sister already! She thinks that R should have a peacock cake for her 3rd birthday and Munni also thinks it will be a really big party HERE! I am praying that we will be celebrating it with her! I also found out that my dossier was sent to the orphanage and my caseworker expects to receive R's CSR rather quickly. She is at a much smaller orphanage than where Munni was and already, they have been VERY responsive to our requests. This brings mixed emotions. One of complete JOY and the other of complete PANIC! Once her CSR gets here, I will have to pay the referral and country/humanitarian fees which are $7,900. In addition, I will also have to file for her immigration and that's another $830. 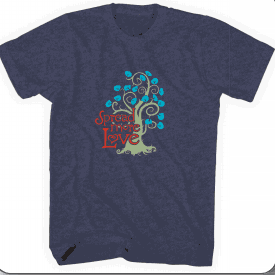 Which brings me to the relaunch of the SPREAD MORE LOVE t-shirts!!! The first time around was MIND BLOWING!!! The $4,290 raised through the fundraiser covered a little over half of my first fees. My agency let me pay the remainder of the balance in two payments due 10/1 and 11/1. I also raised enough money through my photography to pay for the home study update. 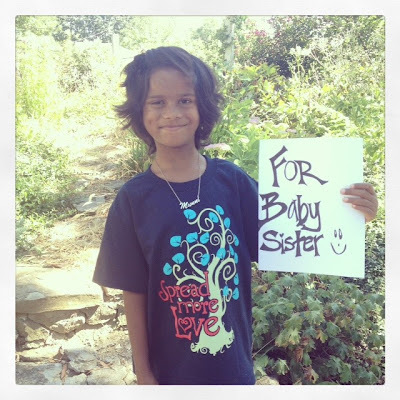 Seriously, how cute does Munni look in this shirt? I just got my shirts on Thursday and I LOVE them!!! They turned out better than I thought! The short sleeve t-shirts are SUPER soft- they are 60% cotton and 40% poly. They have a little stretch to them as well. I rocked it the other night with my skinny jeans and heels and it looked great! The hoodies are my next favorite because they are the perfect weight- not too heavy and not too light plus they too, are SUPER comfy!! Those are 80% cotton and 20% poly. Both the long sleeve and the kid t-shirts are 100% cotton. They aren't quite as soft as the others. If you wanted to buy a t-shirt last time but didn't get to it, NOW IS YOUR CHANCE!!!!! The fund will run for 10 days until September 23rd. I still have to sell the 50 shirt minimum in order for the shirts to print and credit cards to be charged. If I don't sell the minimum of 50, then no shirts are printed and no money is charged. For example, if only 38 shirts are "sold" before 9/23, then the fund closes and no one is charged any money and no shirts are printed. This is where I need your help! If you haven't already, please consider purchasing a shirt! You can buy one here. Also, they DO ship internationally!!!! They have a flat shipping rate of $8 and a flat domestic shipping rate of $5. If you have purchased a shirt, would you please spread the word and SPREAD MORE LOVE?!!!!! The remaining fees from the first set of fees are $1,700 due October 1st, $1,700 due November 1st and then the Referral fee and immigration fees I mentioned above. After that, I will be saving for TRAVEL!!!!!!! WOOOO HOOOOOO!!!!! 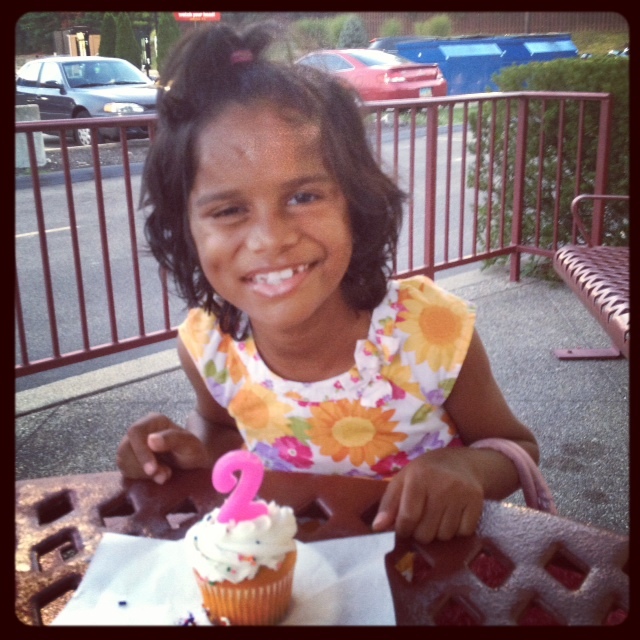 Everything about Sweet R's adoption has been so different from Munni's. From the moment I received the call about her, things have been moving like crazy! I keep praying for her and the process that it will continue to move. Hopefully, round 2 of the SPREAD MORE LOVE campaign will keep things hoppin'!!! Have you heard of Starlight Foundation? LOVE my shirt. Its beauty leads to inquisitive conversations where I get to talk about adoption, advocacy, and amazing children. Hope you sell a ton and bring that baby girl home ASAP!